Christmas is a time for giving and we’ll all be rushing around soon buying presents for relatives and friends to show how much we care. Loved ones who have passed away are never forgotten at this time of year. If you have a grave, it’s not too late to show you’ll be remembering them too by arranging for a holly wreath to be left or other tending services. If you have difficulty visiting graves due to ill health, distance or just because there is never enough time, book us to visit their grave this December. We will tidy the grave for you, wash down the memorial and leave it looking neat and loved. Extra work like cleaning and re-gilding may be able to be done depending on timescale. 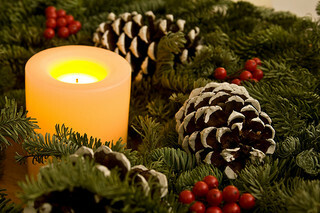 We will also lay a 12” holly wreath as a mark of your love and respect this Christmas season. Other popular choices are holly crosses, posies, cushions or flower arrangements made up of fresh or artificial plants and flowers to your specification. We can also arrange removal of the items after the holiday period. We’ll send you photos to give you peace of mind, too. Our Christmas visits usually take place between 14th and 24th December, so give me a ring today on 0151 228 5616 or drop me an email at ursula@sarsfieldmemorialsliverpool.co.uk if you’d like us to help you remember a special person at this time of year. This year Remembrance Sunday falls on 10 November, and next year is the 100th anniversary of the start of the First World War. At this time, people will gather at the Cenotaph in Whitehall and elsewhere across the country to remember those who suffered or died in the service of their country, as well as everyone who mourns them. The ceremony was initially held on Armistice Day – at the eleventh hour of the eleventh day of the eleventh month – to commemorate the formal end of ‘The War to End All Wars’, when the guns fell silent in Europe. Many thousands of servicemen had died far away from home with no marked grave, denying their families the comfort of laying them to rest. War memorials were erected across the country, not just as national sites of mourning but so relatives and friends had a place to pay tribute and remember their dead. But the ceremony was surprisingly controversial in the aftermath of the First World War. Some saw it as a day of celebration after the troubles war had brought and held commemorative balls. Others objected to a day to revere the dead when living ex-servicemen were suffering from unemployment and poverty. From 1921 onwards, disaffected ex-soldiers even disrupted the ceremony itself, demonstrating at the Cenotaph. In the early 1930s, the Peace Pledge Union sold white poppies, an obvious reference to pacifism and the futility of war. By 1939, we were at war again and Remembrance Day was moved to the closest Sunday to 11th November so it didn’t interrupt the war effort. 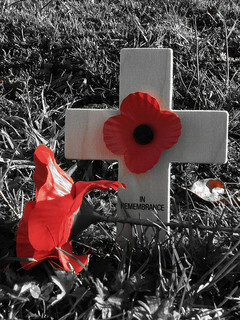 Today our soldiers still fight overseas. They and their families suffer hardship and terrible loss as a result. But whatever our opinions of Remembrance Day, it must be right to set aside some time to think about the horrific effects of war on everyone involved. We at Sarsfield Memorials Liverpool invite you to look at the war graves in your local cemetery and take a moment to remember those we’ve lost in conflicts throughout the years. We understand that any loss of life, in any circumstances, is a tragedy with far-reaching consequences and we’re always ready to listen and advise on ways to gain comfort by remembering and commemorating a love one. Call us any time.